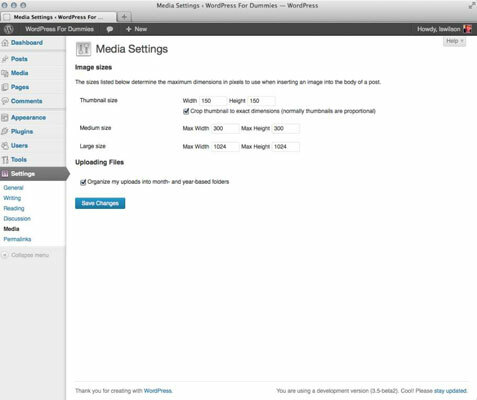 On the Media Settings page in WordPress, you can configure the options for how your media files (graphics and photos) are resized for use in your blog. Click the Media link and the Media Settings page opens. Thumbnail Size: The default is 150 x 150; enter the width and height of your choice. Select the Crop Thumbnail to Exact Dimensions check box to resize the thumbnail exactly to the width and height you specify. Deselect this check box to make WordPress resize the image proportionally. Medium Size: The default is 300 x 300; enter the width and height numbers of your choice. Large Size: The default is 1024 x 1024; enter the width and height numbers of your choice. The last set of options on the Media Settings page is the Uploading Files section. Here, you can tell WordPress where to store your uploaded media files. Select the Organize My Files into Month and Year-Based Folders check box to have WordPress organize your uploaded files in folders by month and by year. Files you upload in February 2013, for example, would be in the following folder: /wp-content/uploads/2013/02/. Likewise, files you upload in January 2013, would be in /wp-content/uploads/2013/01/. This check box is selected by default; deselect it if you don’t want WordPress to organize your files by month and year. Be sure to click the Save Changes button to save your configurations!